CrochetSal's: Okay, so I was never good with diaries either! Okay, so I was never good with diaries either! I admit, I was never good at keeping a diary. Days, sometimes weeks would go by before a word was entered. Only partially because I led a dull and uneventful life. Mostly because I'm just plain forgetful. My girls are back in school, the oldest complaining already that she hates it. It's the homework thing, you know. Until she gets back in 'the swing', I'll have to put up with the melo-drama. As for my youngest, she turns 8 on the 13th and has been crocheting caterpillars to put in the 'goody bags' for her guests. I'm doing my part, too, crocheting Pencil Neck Geek pencil toppers. What a name! you say? Thank my dh! Every once in a while, our computer decides it wants nothing more to do with the camera, or vice versa. Or, it could be mutual. Any way, every couple of months, the camera 'disappears' from the hardware. This time, must have been some fight, cause the two parted ways only a week after I uploaded pics. 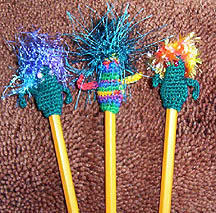 DH did a system restore and uploaded the pic of my newly designed critter pencil toppers. Of course, I could not find them. A call to his cell phone: "Honey, did you upload the pic?" "yes". "Okay, what did you save it as?" And he replied "I thought they looked like pencil neck geeks, so I saved it under that name". Of course, a search couldn't find it, so I had to upload again. Fortunately, the camera and computer are still on speaking terms. The pencil geeks are a free pattern on my site, click here for the pattern. Other patterns just added this month (get all 4 for only $3.95): Back to School Outfit for 4 1/2" (eg. Kelly) dolls, Eyeball Set (one guy at work said it was "sick"...I took that as a compliment), a pencil case/make up case and a Red Hat Snow Woman. Hopefully, it won't be several weeks before I speak up! Although...it seems rather quiet ...is anyone out there?? ?